Wooden handcrafted and painted baseball that can be personalized with name. Perfect sports decoration for game room, kids room , office, or for any baseball fan. 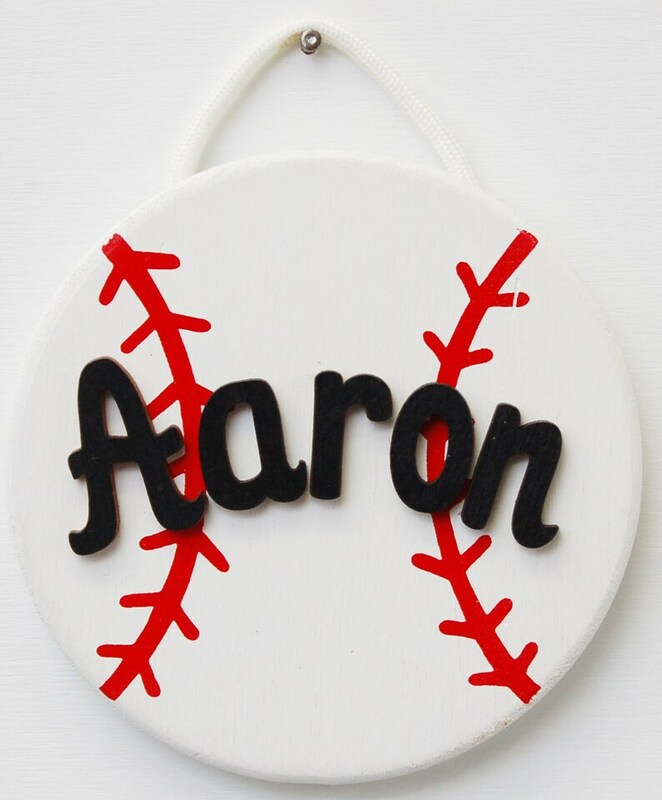 Personalized baseball is painted with high quality exterior paint and hung by a white rope. Baseball can be personalized in black wooden letters with any name you choose. The baby's room is zebra print and hot pink and is perfect! I received this item sooner than I thought I would. I will purchase again from this shop. I love the sign and the shipping was fast. Thank you! Adds lots if color to our new patio. Awesome once again, love every detail ! Can't wait to see more of UCSign's at various craft shows ! Please include your phone number if items are being personalized! We want you to be 100% satisfied with your purchase. We accept returns within 30 days of the order being placed. Personalized items are final sale, unless we have made an error with spelling (which we would of course correct). Buyer is responsible for return shipping, unless it is an error on our part. We try to process all orders and send out within 2 business days. Shipping time may vary depending on location. All items ship from SW Michigan. We also offer wholesale discounts to those who wish to resell. Please contact our wholesale accounts manager, heidi@uniquelycraftedonline.com to discuss.